My adopted home waters by virtue of proximity, Boulder Creek as well as South Boulder Creek and the various forks of the St. Vrain are a small stream fisher's paradise. The closest for me is Boulder Creek in Boulder and up the canyon above town. 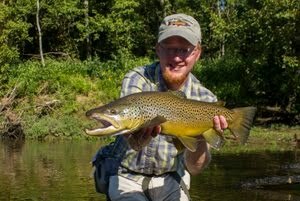 Did I mention that it holds predominantly brown trout? 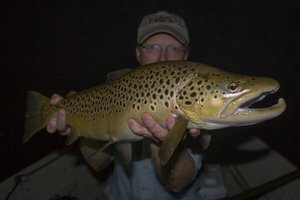 Most who know me are well aware that I enjoy catching browns perhaps more than any other species. Its always difficult to complain though when something else tugs at the end of the line. Really I just enjoy getting out on the water and away from the hustle and bustle of life. Two days ago, I was able to do just that. After leaving work, I headed home for a quick supper and then it was off to Boulder. I had heard some good things about one of the area fly shops including recommendations from friends and acquaintances. Eventually I'll probably stop by all the area shops but I think I have already found a new "home" shop. Rocky Mountain Anglers in Boulder is a fantastic shop. After only one visit, I would rank it in the top 5 shops I have ever visited. That is an obviously biased ranking so you probably want to know how I determine my list of top shops. It is actually pretty simple and based on one question: do the shop staff treat me well regardless of whether or not I am actually buying something or look like a real fisherman? Many shops around the country are staffed by people who won't give you the time of day unless you are looking for the newest and most expensive fly rod on the market and definitely don't want to bother talking to you if you don't look the part of the fly fisher. Maybe I'm just rebellious but I've never been one to dress like a fisherman when I'm visiting shops. Rocky Mountain Anglers is now towards the top of my list along with Little River Outfitters, Blue Ribbon Flies, Taylor Creek Fly Shop, and a little tiny shop called Solitude Outdoors in Cedaredge, Colorado. At each of these shops, I was treated like royalty, and for that they have all earned my loyalty and business. My question at Rocky Mountain Anglers was pretty simple. I wanted a recommendation on a good guidebook to help familiarize myself with the area. Instead of selling me a book that might only offer limited insights, the shop staff took the time to look at my Colorado Delorme, making notes and circling likely fishing spots. That is something average shops will never even consider unless you are investing in the shop's stock or other such nonsense. While I may not buy a brand new rod from them next week, they will definitely have my business when I need all the random gear and tying equipment that keeps me going in the sport. After my stop at the shop it was off for Boulder Canyon. Time was somewhat limited so after driving just a few miles to find some nice steep pocket water, I pulled into a likely looking spot and rigged up. The only rod I had with me happened to also be my favorite: an 8' 4 weight Orvis Superfine Tight Loop (one of the old Superfine rods). I started with a Crawbugger on inspiration from the Oak Creek Angler who often utilizes this deadly pattern with great results. The one big pool I wanted to try this pattern in did not produce so I went to plan B. Rusty spinners were increasing rapidly in number above the water so I dug out a Parachute Adams that I had tied in more of a rusty brown color and added a favorite soft hackle dropper. The first little pocket I hit produced several strikes before I actually connected with a feisty little brown that found the soft hackle dropper to its liking. I started covering water and the fish came with more and more consistency as the light began to fade. Considering how low the water was and that this was my first time, I think I did fairly well. I fished for probably somewhere between 1 and 2 hours and caught between 10 and 20 fish. I know that's quite a spread, but when you're enjoying the experience, my general philosophy is that counting should be the last thing you think about. At one point I was surprised to catch a brookie although I know they are Colorado's version of the plague....an invasive species that has adapted a little too well to the local streams and lakes. Coming from Tennessee, it is kind of nice to see the beautiful little reminders of home although at the same time it can bring on the occasional bout of homesicknesses for the mountain streams of Tennessee. The brookie was apparently the exception as every other fish was a brown ranging between 4 and 9-10 or so inches. 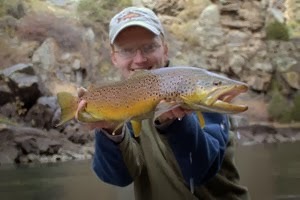 Large browns are apparently extremely rare in Boulder Creek based on the research I have done. The last fish of the evening came out of a section where the creek was beginning to narrow into a steeper stretch. It was a beautiful pool that almost guaranteed a better fish. Still, I'm not sure who was more surprised, me or the fish. I had to resort to using the flash and realized it was probably late enough to head home. The first of what I hope will be many pleasant hours on Boulder Creek was finished. This afternoon I made the mistake of looking over maps of National Parks, National Forests, and famous rivers here in Colorado. Now I'm already planning trips further afield. This weekend I'm leaning towards a trip for cutthroat somewhere in the high mountains. As the days shorten and fall approaches, I'll be hitting the larger streams for big browns, but until then you will probably find me somewhere on a small stream in a canyon catching willing trout. Looks like you're getting to know these homewaters well, and quick! Some of my favorite places. And the guys at RMA are top notch! Great looking water and fish, David. Seems as if you are wasting no time at all. Very jealous. Good to see you're getting settled in. I think you're going to like Colorado. Mark, I think so too...lots of cool places out here! David, much like you I recently moved to Colorado from Idaho. 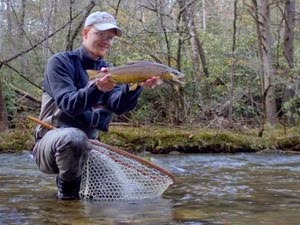 I, too, have been busy trying to learn as quickly as I can by fly fishing some of the great small streams in the area. Boulder Creek treated me well on my first trip there. I didn't make the canyon, but, did enjoy through town. Anyway, added your blog to my blog list and am glad to share readers and stories with you. Mel, thanks for stopping by and reading. 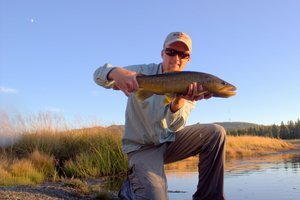 I'll be following your blog to find some new area fishing ideas! David, You will have to come down my way one of these days. I'll have to show you a few different places when you get the chance. Juan, I definitely want to make it down your way. I'll shoot you an email or FB message and see if we can figure something out...I'm looking forward to the chance to meet you and fish some new water!